Part of a collection I have begun of exterior/interior spaces in and around the up and coming fashionable East Village area of Des Moines, Iowa. A number of neighborhood buildings are in a state of flux. 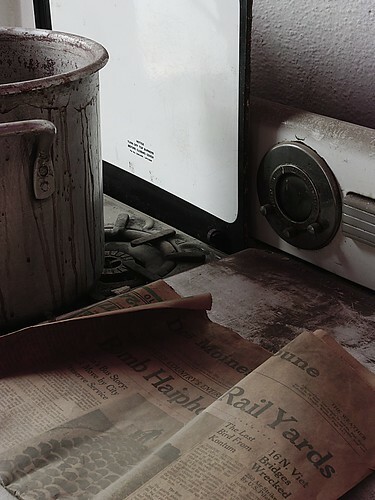 What is interesting to find is the hidden “time capsules” among the many old sometimes forgotten rooms. This particular series is a partial and ongoing collection that is connected in conflict to our own time of unrest in the middle east. The newspaper, The Des Moines Tribune – dated May 30, 1972 – has a number of the front-page stories dealing with the conflict in Southeast Asia – “The last bird from Kuntom – South Viet Nam”….. “250 Air-strikes… US forces…” Seems an uncanny parallel to the “War on Terror” today. While the War in Iraq, and Afghanistan is in no way as devastating as the VietNam conflict in terms of human casualties suffered (thus far) – it should be of no less a weight on our collective minds. This entry was posted in Matt Niebuhr - Photography and tagged ( Matt Niebuhr - Works ) by Matt Niebuhr - West Branch Studio. Bookmark the permalink.